Prof. Michael Salla - 4th July The Sun and Crop Circles. they would arrive right on the predicted date of July 7. 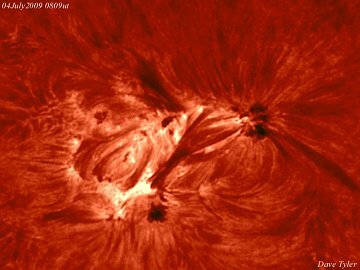 The magnetic polarity of sunspot 1024 identifies it as a member of new Solar Cycle 24. June 24. 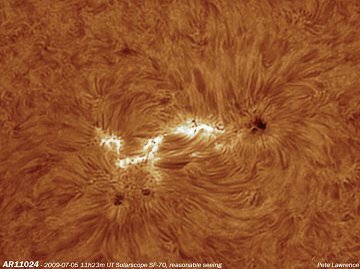 So it is a ‘coincidence’ that a sunspot would suddenly appear on U.S. Independence Day that is generating solar flares. 7 as dates when CMEs will hit the Earth. newspapers and TV channels remain strangely silent. Why is that?" the ramification of IF NOT, are great:"
help answer the question as to whether they are hoaxes or extraterrestrial in origin. years leading up to and beyond the peak of Cycle 24 which is around 2012.
www.SpaceWeather.com . Copyright: David Tyler. 4 July 2009. I thank Prof. Salla for his permission to publish his article here. The very latest from SpaceWeather 5th July, 2009. The latest close up of 1024. Copyright: Pete Lawrence. Thanks to Dave Smith for this alert.